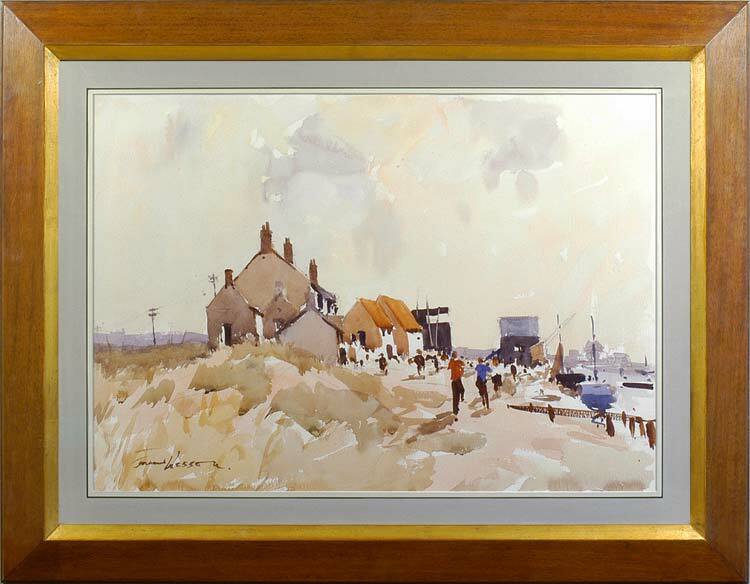 Set against the vast East Anglian sky, a huddle of seaside cottages seems to grow from the coarse grass of the dunes, like a natural outcrop of rock facing the little harbour. The open land between sea and cottages is full of busy figures, suggested in a line or two of paint, just as yachts and grass are suggested in cursive scribbles and blots. The whole composition is full of light, although the sky is clouded, and there is no sentimental nostalgia for an earlier rural Norfolk: the aerial on a roof and the telegraph pole in the distance establish the modernity of Wesson’s vision.